What if your father was one of the 20th century’s most celebrated painters? How would you define yourself against that kind of talent and machismo? 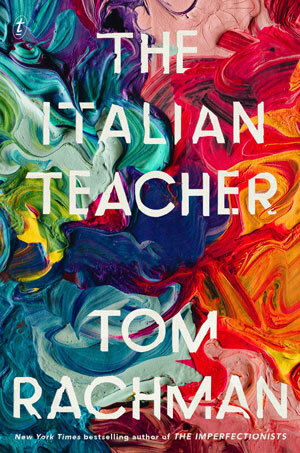 In The Italian Teacher, his third novel, Tom Rachman sets in play just that dynamic. Bear Bavinsky is a world-famous painter, a first-class narcissist and father of 17 children who he treats with careless, sometimes callous, warmth. Bear’s shy son Pinch loves to paint, but his ambitions are snuffed by his father’s offhand critique: “I got to tell you, kiddo. You’re not an artist and you never will be.” After that, nothing in Pinch’s life seems to gel. When Bear abandons his family, Pinch strives to make himself worthy of his father’s attention, first trying to be a painter himself; then resolving to write his father’s biography; eventually settling, disillusioned, into a job as an Italian teacher in London. With Rachman’s signature humanity and humor, The Italian Teacher examines a life lived in the shadow of greatness. If you enjoyed William Boyd’s Any Human Heart, you’ll love this portrait of Pinch, who has the good luck to both outlive and survive his famous father, and to find, in the end, a way to take ownership of his difficult legacy. Published on March 30, 2018 in Literary Loop and tagged front by Kristy Johnson.